You are the one who made, carried and birthed a baby. You may not know it all now but you are the one person who knows your baby the best. So what if you didn't get a load of washing on, remember to feed the dog or manage to put makeup on. Did you get to cuddle your baby instead? Yep, well that's all you needed to do. Don't let any healthcare professionals bamboozle you with jargon or tell you how to do things 'the best way'. Take their 'advice' on board but don't be a slave to it, if you think it's not working for you or you find a better way, go with it. Same if you think something isn't right, trust your gut. Remember it's your baby so it's your way. First time around I didn't enjoy the early days and wish I could go back and cuddle my newborn more. This time around I aim to spoil my baby more and take every opportunity to just sit and look. There will be 'that' woman at the school gates, around the supermarket or in a baby class who has lost her baby weight, gone back to work already or has a baby that sleeps through the night. Who cares, good luck to her. Please don't compare yourself to anyone else, you never know what goes on behind closed doors. It hurts, really hurts but it will pass. Whilst you are in it, remember to take care of yourself, be kind and eat well. Do whatever helps get you through it, whether that's drinking pints of coffee, sweet treats galore or not doing much at all. Don't do too much or push yourself too hard, rest rather than clean and relax if you can't actually sleep. Sit in the garden with your eyes closed and take a few deep breaths, sometimes it's enough but if it isn't, just remember, sleep will come again. Whether its a cup of tea at your mums or phoning a friend for a chat, every little helps. Remember to get out in the fresh air as much as you can, it helps clear the cobwebs, usually makes your baby sleep better and lets your body and mind focus on something else. So don't compare yourself to one. Gisele and Tamara Ecclestone may have been parading around in pre pregnancy outfits as soon as baby was out but it's their job to do this. They have teams of people helping them and making sure it happens and quickly! 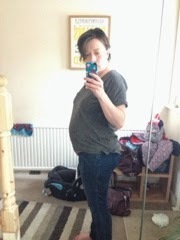 Many more woman are still in their pregnancy jeans long after the baby is grown, trust me, noone looks back and thinks 'Gosh I should have worked out more to get back into shape quicker' it'd be more 'wow where did the time go, wish I'd have sat down more and really taken in all that my baby is'. This is me, three weeks after having my second baby. My hair is a mess, I'm still looking more pregnant than not and I'm so tired. Look at the chaos behind me too, I now embrace the mess! So what if your baby is screaming, the toddler is having a tantrum and you've run out of clean clothes. If you leave the house with baby sick all over your shoulder (which you will at some point), don't worry, just relax. Every other mother out there will empathise with you and you are not alone.